It kind of stumped me for a little while. Maybe it as not just reading the message properly. The answer to solve the problem seems to be to turn off the “Annotation Crop Box”. When turned off the copying and pastings of text works fine. 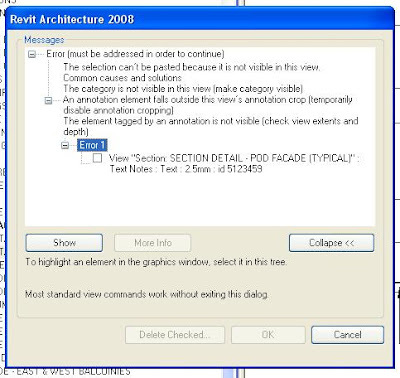 This is an issue obviously came up in Revit 2008 with the addition of annotation crop boxes. I can’t say if the problem exists in Revit 2009 or not.